Removing scratches from auto paint is a multi-step process that starts with leveling the paint surrounding the scratch and ends with restoring the shine. The number of steps depends on the severity of the scratch. This general guide to scratch removal will describe a typical scratch removal process. There are many techniques and tools available and you may find your own variation of this process that works for you. 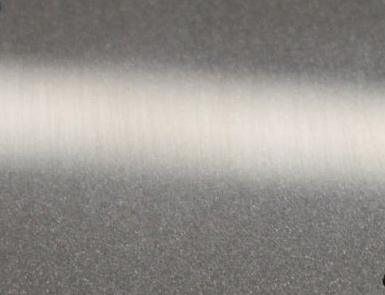 This guide describes how to remove random isolated deep scratches (RIDS). 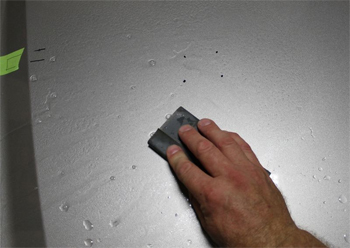 For overall swirl removal or fine scratch removal, you would use a polisher and a compound. That process is described in our Dual Action Polisher Guide and Rotary Polisher Guide. If you have isolated scratches that are too deep to remove without sanding, you're on the right page. 1. This guide describes sanding by hand and then using a dual action polisher to compound and polish. This is one way of doing it. The best tool to remove sanding marks from an entire car is a rotary buffer with a wool pad, the appropriate compound and a little experience. Here, we're working on isolated scratches. 2. Factory baked-on paint is usually thin and hard, that's two HUGE negatives working against you should you be in a position to want or need to sand on factory paint. Always do a Test Spot to a small section and make sure you can get 100% of your sanding marks out before sanding further. 3. Always use the least aggressive approach to get the job done. 4. Only sand enough to remove or improve the defects you're trying to remove. 5. Remember that sanding removes paint as does the compounding and polishing process, so take this into account as you work. 6. If possible, use a Paint Thickness Gauge to measure the film-build before sanding. Make a note of the reading you take for before, during and after. A Paint Thickness Gauge is a handy tool to give you an indication as to overall paint thickness as well as any bodywork or re-paint that has been done to spot areas or entire panels. 7. Don't sand too close to edges or hard/sharp body lines. 8. Most important - Always work clean. Start by soaking your sanding papers for at least 15 minutes in a solution of water and a couple drops of Pinnacle Bodywork Shampoo. You should have three different grits. Because these grit particles can come off in the water, soak your papers in separate buckets to avoid cross-contamination. 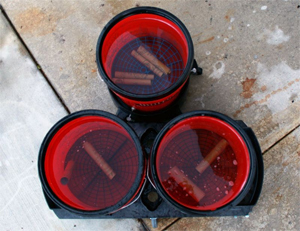 You may want to use three Grit Guard 5 Gallon Wash Buckets. Next, take your 2000 grit sandpaper and wrap it around the Meguiar's E-7200 Rubber Backing Pad. This pad will help distribute the pressure of your fingers over the paper. Variation: For very small scratches, you can also cut your sandpaper into small postage stamp size squares and use your fingertips as the backing pad. 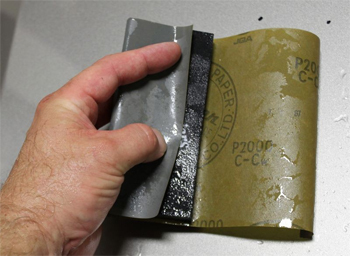 Fold the sandpaper around the backup pad and use the seamless side on the paint. 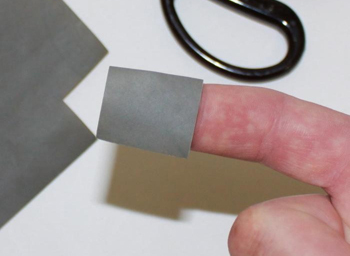 For isolated scratches, you can use small pieces of sandpaper. Be sure to feather out from the scratch, easing up the further you get away from the scratch. You want to sand-out the scratch which would mean removing most of the paint directly near the scratch, which is a void of paint, but feather or taper the depth of your sanding marks as you move away from the scratch as you blend the area with the surrounding paint. This will create a level appearance. Back to the backing pad. Turn the pad with the sandpaper at an angle so you're sanding across the scratch, never straight up and down. Use the water bottle with clean water and a couple drops of shampoo to generously wet the paint you'll be sanding. Continuously spray the paint while you work to help the sandpaper glide easily. Always sand at an angle, never completely perpendicular to a scratch. Clear coat comes off in a whitish slurry as you sand. Single stage paint will come off in a colored slurry. Important: If you're removing multiple isolated scratches, it is important to remove the same amount of paint from each area so the overall results are uniform. This is where a PosiTest Paint Thickness Gauge will come in handy. It can verify that you've removed the same amount of paint from each area. It helps to count your strokes with the sandpaper so you can duplicate the process if you have multiple scratches of the same depth. Wipe off the slurry (removed clear coat and water) so you can see your results. The deep scratch should be replaced with finer 2000 grit scratches. Resand each section with the 2500 grit sandpaper wrapped around your baking pad. Keep the paint wet and work with the pad angled. Take care not to over-sand the paint. You only want to eliminate the deeper 2000 grit scratches. Wipe off the slurry and inspect the results. The sanding scratches should be finer and less distinct. After sanding, reflections should appear blurry with no obvious sanding scratches. Resand each section with the 3000 grit sandpaper wrapped around the backing pad. Same rules apply as with the two previous rounds. Wipe off the slurry and inspect the results. You know when you're ready to compound by looking at the area you've sanded. Reflections of the overhead light or of the Brinkman Swirl Finder Light should be blurry and dull with no obvious deep sanding scratches. For the compounding and polishing steps, attach the 2-3/4 inch Hook & Loop Rotary Backing Plate and D.A Adapter 5/8" X 11 to the Porter Cable 7424XP Dual Action Polisher. Apply an X of Wolfgang Total Swirl Remover 3.0 across the yellow cutting pad. Operate the Porter Cable 7424XP Dual Action Polisher at a speed of 6 and work back and forth and then up and down across the sanding scratches. If you've sanded more than one area, make sure you duplicate this process on every spot so the results are uniform. 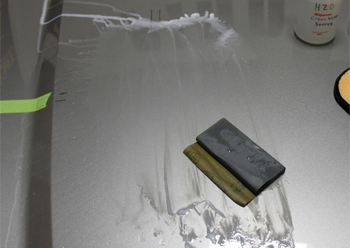 Wipe off the paint with a clean microfiber polishing cloth. 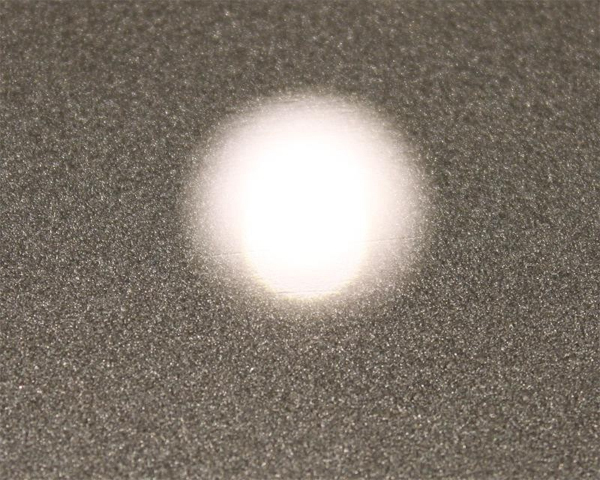 Apply an X of Wolfgang Finishing Glaze 3.0 to the white foam polishing pad. Operate the Porter Cable 7424XP Dual Action Polisher at a speed of 5. Just like the compounding step, you want to use the same number of passes with the polisher on each section of a panel to create uniform results. Once the paint is polished and scratch-free, apply your favorite wax or paint sealant.